Greek Honey Dainties are more often known as melomakarona, and I see them all the time in bakeries in NYC. It’s about time I made some of this deliciousness at home. I sadly never seem to get around to making many Christmas cookies, so I took this as an opportunity to get festive and made the Christmas-Spiced Honey Dainties version. The batter is easy to put together and flavored with so many good things, like orange juice and zest and the usual holiday spice suspects. It is a soft dough though, so I chose to refrigerate it for about half an hour before I scooped and shaped the cookies into their traditional ovals. After baking and cooling, the cookies are drenched a few times over in a honey syrup similar to the one baklava is soaked in and sprinkled with walnuts (which I toasted while the cookies baked). The honey syrup, btw, is amazing! I veered slightly off the recipe, which called for orange peel, cinnamon stick and whole cloves, and used some mulling spice mix that I have in a little tin (it also has allspice berries and star anise pods in it) and finished it off with a splish of Grand Marnier while it cooled. You bet I saved every leftover drop….I think it will be awesome in tea or hot toddys. The cookies, too, are awesome. They must be handled carefully, but they do keep their texture, even with all that syrupy goodness poured over them. So perfect with coffee, and I’ll soon test them with vin santo…if there is probably a Greek sweet wine I should know about pairing with them, please let me know. 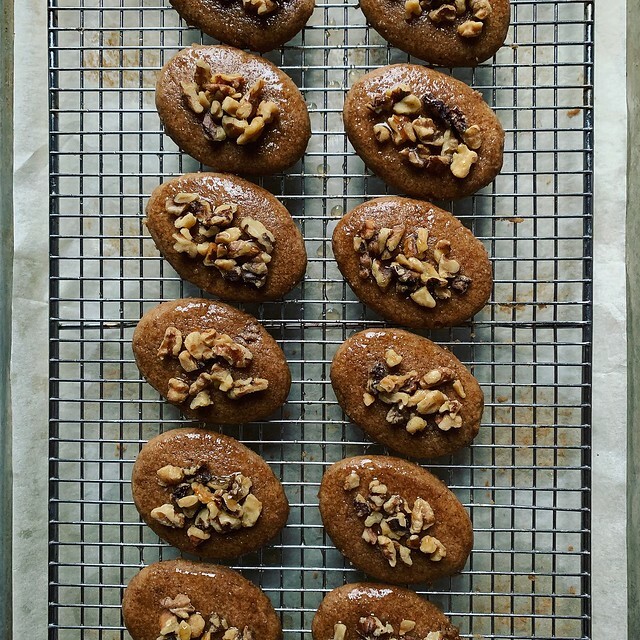 For the recipe, see Dorie’s Cookies by Dorie Greenspan. Don’t forget to check out the rest of the TWD Blogroll and please join us if you haven’t already. I’ve made a larger galette version and the classic cookie version of Dorie’s jammers before, and these Spiced Pumpkin Jammers are a take on those. Here, a sweet and sandy spiced sablé base is topped with a pumpkin-cream cheese mix and ringed with sweet pumpkin seed streusel. Don’t expect immediate gratification…this is a recipe for when you have some time to spend and want a project. These can be formed in either rings or muffin tins to get a crisp, round shape. I went with my muffin pan. Rather than roll, chill and cut the sablé dough to fit the tins, I used a little cookie scoop to portion it out right after I made it, and then just pressed it in. Be sure to grease the cavities of the molds well, as these are delicate. You’ll notice these’s one missing in the picture, and that’s because I destroyed it trying to get it out. I ate it anyway and shared a half dozen of the rest with the trainers at my gym (who all have a secret sweet tooth)…we all gave them glowing reviews! 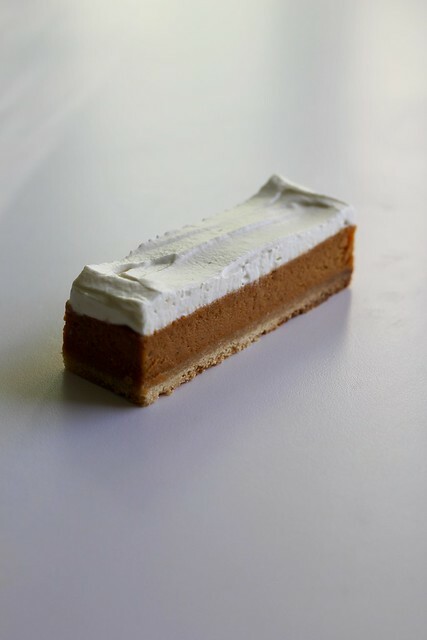 They’re like pumpkin pie bites, and, fyi, a little blob of whipped cream on top certainly doesn’t hurt anything. 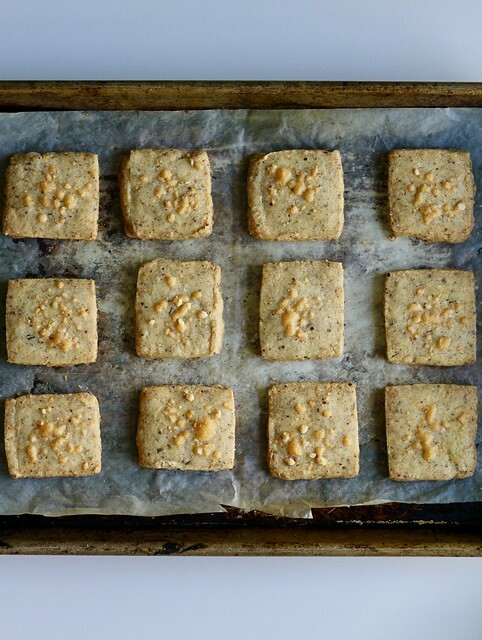 For the recipe, see Dorie’s Cookies by Dorie Greenspan. Don’t forget to check out the rest of the TWD Blogroll. We’re definitely moving into fall here in the US, and our cookie choices this month reflect that. Maple-Star Anise Cookies are flavored with, you guessed it, maple syrup and star anise (a spice I don’t often use, but have at home as part of a mulling spice blend someone gave me), as well as cinnamon, ginger and orange zest. These are soft and spicy cookies, on the cakey side, and while I suppose you could eat them as is, they are a natural match for maple and spice cream cheese frosting. You can schmear just one side with frosting and have them open-faced, or you can schmear and then sandwich them, which is what i did here. 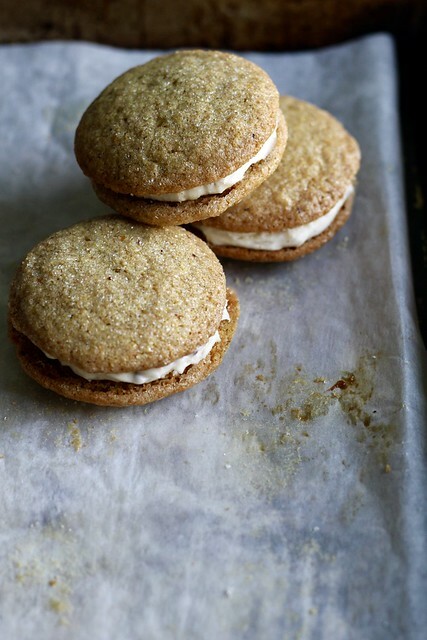 They remind me of whoopee pies, but a bit more delicate. The cookies spread a lot in the oven and need plenty of space on the sheet tray…I found that freezing the dough balls for just the amount of time it took to preheat the oven helped control things a bit and keep them round. 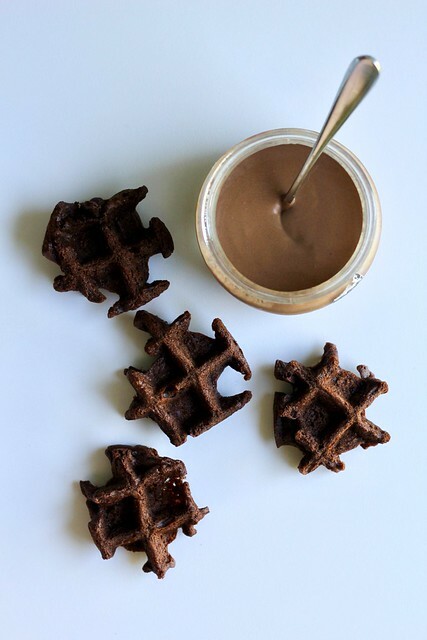 Buckwheat and dark chocolate is a combination that is oh-so-good. The earthy nuttiness and bittersweetness all just work together. 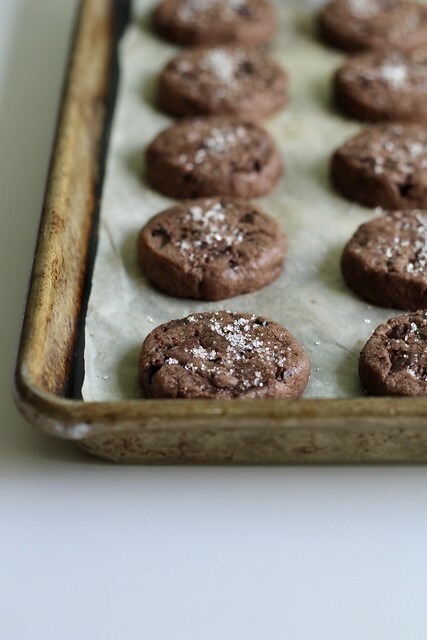 So naturally it follows that Double-Buckwheat Double-Chocolate Cookies should be oh-so-so-good. And I just know that they are, but here’s where I will confess something…I actually made single-buckwheat triple-chocolate cookies. The two types of buckwheat called for in the recipe are flour and kasha. The flour I have already, but the kasha I don’t. Since I’m on a self-imposed lockdown on the purchase of any new flours, grains and condiments (my fridge and cabinets are seriously out of control), I didn’t go out and get any. I did want that crunchy element that the kasha would have added to the cookies, so I reached into my freezer drawer and pulled out my baggie of cocoa nibs and added them to the cocoa powder and chopped chocolate already in the recipe. The dough can be rolled out into a sheet and cut, or rolled into log and sliced. I opted for the slice-and-bake version. These cookies are great. They’re nice and soft inside (with that bit of crunch! ), and a sprinkling of salt and sugar on top gives the flavor a real pop. 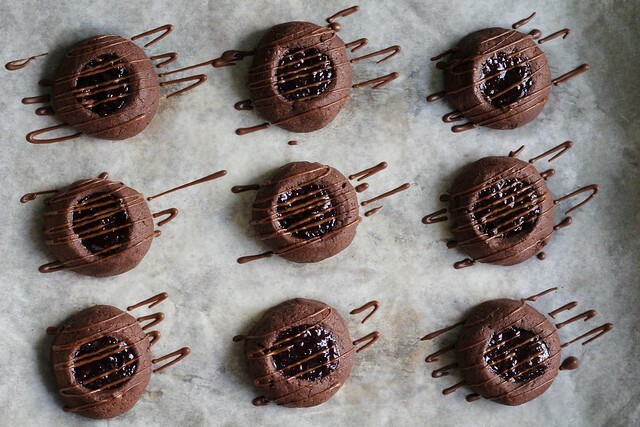 A Brooklyn bakery called Bien Cuit makes similarly flavored salted chocolate buckwheat cookies, which I buy from time to time and have found to be the perfect nibble with an afternoon coffee. The same is true with these. Small and not too sweet, they are just right. Sometimes I’m kind of “eh” on fruit and chocolate combinations, but I’ll admit that these Chocolate-Raspberry Thumbprints are good little cookies. The chocolate dough is Dorie’s “Do-Almost-Anything” dough and rolled into balls, it makes a nice, soft thumbprint cookie. I filled my prints with a not-to-sweet jam from Sqirl that I bought at a local cheese shop. I was pleased not to have any jam overflow and it set up nicely once the cookies were baked and cooked. I gave them the little drizzle of chocolate for some extra pizzaz. I’m pretty sure everyone I’ll give them to will be happy that I shared. I’ve always thought of pistachios as “fancy” nuts. Hazelnuts and macadamias are also fancy nuts. Almonds and walnuts are regular nuts. Cashews are somewhere in between. I’m working on drawing up my nut hierarchy diagram for you…it’s actually very complex. Because for whatever reason I consider them fancy, I usually use pistachios sparingly. For Pistachio-Berry Slims, though, I had to go all out. (I admit that I briefly considered cutting the pistachios with half almonds, but then decided not to be so stingy.) These are chewy nut macaroons– no wheat flour, no dairy– just ground pistachios, sugar and egg whites, formed and baked into a log. 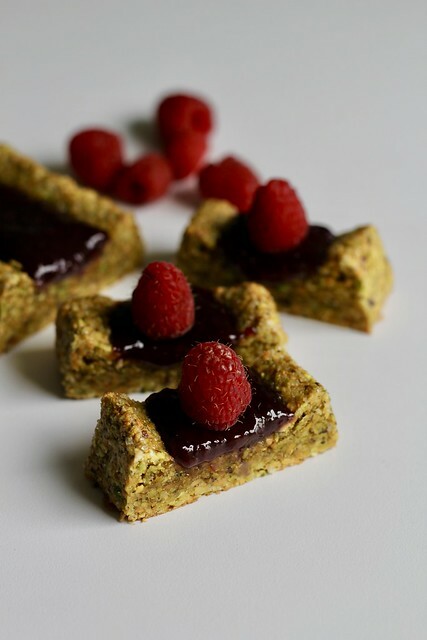 They are further fancified with a trench of nice raspberry jam and fresh berries running through the middle. 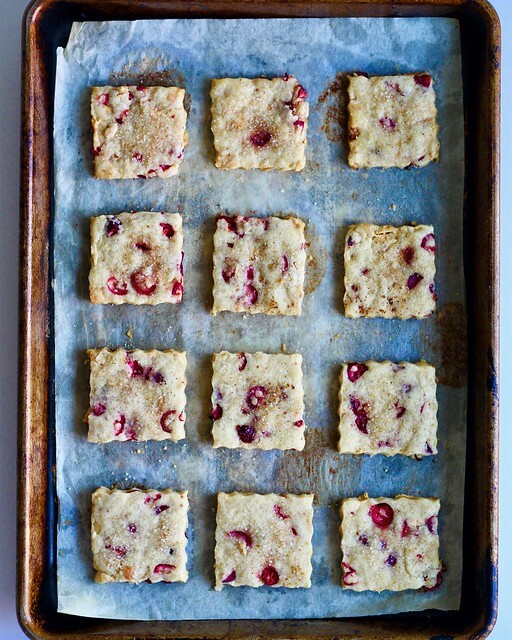 Sliced into dainty slims, these are lovely little cookies, to be eaten with pinkies up. As Dorie says in the recipe intro, no one needs to know they take 10 minutes to prepare. 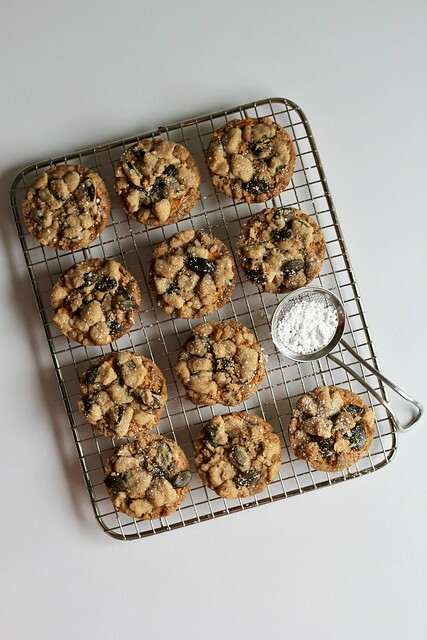 For the recipe, see Dorie’s Cookies by Dorie Greenspan. Don’t forget to check out the rest of this week’s rewind TWD Blogroll!